Description: Believed to have originated near Brussels, Belgium, brussels sprouts is a versatile vegetable closely related to the cabbage family. Cut off from the stems which can grow to 3 feet or taller, the buds are typically small and have the appearance of tiny cabbages. Brussels sprouts are often boiled, steamed, or roasted, but also can be used in stir-frys. They are relatively easy to grow and are cold tolerant with a typical growth cycle of 3 months or less. . Kitchen Pharmacy: Brussel sprouts are believed to have great anticancer properties and many believe they reduce your risk of getting cancer. They are seen as very beneficial to lowering cholesterol as well as promoting good heart health. 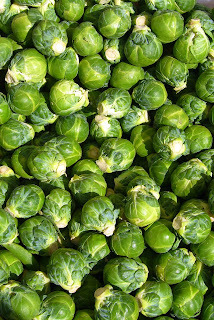 Sprouts are also believed to reduce inflamation and help prevent and fight against the common cold.